In the Holy Desert Raraku, the seer Sha'ik and her followers prepare for the long-prophesied uprising named the Whirlwind. Enslaved in the Otataral mines, Felisin, youngest scion of the disgraced House of Paran, dreams of freedom and vows revenge, while the outlawed Brigdburners Fiddler and Kalam conspire to rid the world of Empress Laseen (although it seems the gods would, as always have it otherwise). And as two ancient warriors - bearers of a devastating secret - enter this blighted land, so an untried commander of the Malaz 7th Army leads his war-weary troops in a last, valiant running battle to save the lives of thirty thousand refugees. Deadhouse Gates is the second book in Steven Erikson’s epic fantasy series The Malazan Book of the Fallen. It takes place on the fictional continent of Seven Cities, and introduces a plethora of new characters to the series, as well as continuing to follow a few from the first book. All of the events in Deadhouse Gates are centred around, or influenced by, the continent-wide rebellion that was heavily foreshadowed in Gardens of the Moon, and feature conflict and bloodshed on a thus far unprecedented scale. The plot of Deadhouse Gates is much more tightly woven and focused than that of Gardens of the Moon, concentrated as it is on just a handful of major characters, yet it’s also much more ambitious. Each of the storylines could well have been a book in their own right, yet are artfully woven together into a cohesive pattern of events leading gradually but inevitably towards a catastrophic conclusion. The grand scale of the main plotline is the first true example of what the author is capable of, and the incredible storytelling is just a hint of what the rest of the series has in store. Deadhouse Gates gives us our first real look at Seven Cities, a culturally diverse desert continent made up largely of warring tribes and religious cities; a continent in the midst of a violent rebellion against the control of the Malazan Empire. Led by a Seeress known as Sha’ik, this rebellion – the Whirlwind Apocalypse – threatens to return the land to its pre-Imperial state of ignorance and tradition, blood feuds and senseless violence. The soldiers of the Apocalypse have driven their Malazan conquerors out of all but one of the Holy Cities, and it is their panicked flight that is the focus of the story: the Chain of Dogs, fifty thousand Malazan refugees escorted across a hostile desert continent by what remains of the Malazan Seventh army and its commander, Coltaine; stumbling just ahead of a renegade army that vastly outnumbers them all. Their plight is shown to us through the eyes of Duiker, who, as Imperial Historian, is obliged to witness and record every detail of this fraught and seemingly impossible journey. And what a journey! Not just for the characters, but for us as readers. For the first time in the series – but certainly not the last – Erikson throws us into an emotional blender, and then spends the better part of a thousand pages gradually cranking the setting higher and higher before finally letting us crawl our way back out again, shredded and shaken. As the characters experience shock, fear, determination, fury, pathos, hope, despair, and finally wordless outrage, so do we. I’m not easily moved but I spent much of the last 150 pages of Deadhouse Gates on the brink of tears, partly because I knew what was coming and partly because Erikson has the rare and incredible talent of being able to stir his readers’ emotions with his words, even on a third re-read of the book. The other storylines are also brilliant and worthy of mention, although I don’t think anyone will deny that Coltaine’s Chain of Dogs takes centre stage: there’s also the tale of Felisin, yanked from the comforts of her rich lifestyle during the Cull of the Nobility and forced to extreme measures to survive the slave pits with the help of two unlikely companions; then there’s Fiddler, former soldier of the Bridgeburners, seeking an ancient legend in the holy desert of Raraku and completely out of his depth; Mappo, a Trell warrior endlessly trapped between his loyalty to a sacred vow and his friendship with the man whom he is sworn to destroy; and the assassin Kalam, returned to his home continent and bent on pursuing vengeance against the Empress who wronged him. 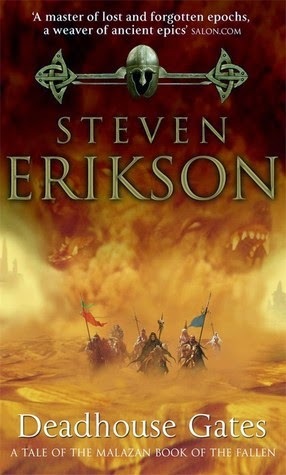 Each of the storylines are interwoven, and skilfully set the stage for the events of future books in the series; and once again Erikson shows an endless capacity for creating unique and memorable characters, such as the devious High Priest of Shadow Iskaral Pust. Gardens of the Moon is brilliant, but Deadhouse Gates is simply astounding in its storytelling, and left me a gibbering, goosebump-laden wreck – even though I’d already read the thing three times before. I envy those reading it for the first time, and can’t wait to get re-acquainted with the rest of this incredible series.